A game like this would have stung when we were top of the table. It would have hurt midseason. But at the end of the season, 1 point behind Juventus, this match had all of the tenderness of a concrete block to the face. And that’s taking into consideration that we barely grabbed the draw, it could have been worse. Ibra misinterprets the term "sitter." I couldn’t believe it, either, we started so strong. In the first minute, there was a Muntari challenge on Mudingayi and a shot from Ibra saved by Agliardi. Fast forward to the 4th, where Mudingayi fouled Ibra. a strong foul that earned him a talking to by the ref, and would have been a card if it weren’t so early in the match. The resulting free kick was taken by Ibra, just a very short pass to Seedorf, who sent the shot just wide. The story of this match, opportunities missed. And that was just the first 5 minutes. There was no love lost early on, either. First, van Bommel gave a little body slam to Perez once he was down, and they were mixing it up. Then in the 11th, Di Vaio and Nesta hit heads, luckily Di Vaio seemed to take the worst of that one, but they were both able to continue. I suppose one of the big facepalm moments of the game was in the 16th, when Ibra tried a left foot shot that went just wide. Or you could say he Robinhoed™ it. Abbiati was forced into duty after that, but then Perez earned himself a yellow at the other end for fouling Nocerino just outside of the box. And the resulting free kick? Cleared, of course, missed opportunities. In the 26th, Bologna changed the game for their benefit when van Bommel lost the ball to Diamanti in a dangerous spot, our defense was missing in action, and an easy pass into Ramirez saw him score a goal and leave Bonera and Abate choking in the dust. 0-1 Bologna. That was all Milan needed to go in a complete downward spiral for the rest of the half. Nesta, apparently choosing NOT playing center back today, was all over the rest of the pitch, up both wings, up in the midfield, even trying shots on goal. Not sure where he was when Diamanti scored, but it was an interesting thing to behold. I’m guessing that Bonera and even Abate and Antonini may not have been as amused, although at least Abate had the presence of mind to go back and try to cover for the Senator. The first half ended, as you could probably guess, with a shot saved by Agliardi. The second half saw improved effort, in fact Seedorf came out in the 46th with a nice shot that was unfortunately saved. 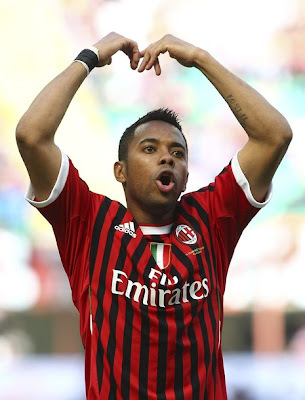 Then Robinho had a shot blocked, and Nocerino took a shot wide, all in less than 3 minutes time. Perhaps in frustration, Nocerino then earned a yellow card for a bad foul on Ramirez. I’ll say one thing for Ramirez, he can certainly take a beating. In the 53rd, Abbiati tipped a dangerous shot just over the crossbar, it must be said that he was called into action a little too often on the day. Heart surgery, schmeart schmurgery. Cassano is BACK. Then a miracle occurred. Not only did Allegri make an early tactical substitution, but after Maxi Lopez had been warming up, he brought on Cassano instead in the 56th, and for Seedorf, no less, who had not had his best game. Nevermind that Seedorf went straight into the locker room to pout or whatever, Cassano was going to have almost forty minutes. Bringing him on was a revelation, too, as everyone stepped up the pace. Ibra, who had looked lethargic up until this point, was suddenly all over the place and taking shots left and right. That’s because Cassano was serving it up for him, for anyone he could find. His energy and vision revitalized the whole team singlehandedly. He even had a great shot that was blocked in the 67th. With a little more time on the pitch, maybe he could have been a goalscorer, too. Remember in the preview when I said that I didn’t want the referee to be the story in this match? Well he almost wasn’t. Because in the 58th, Ibra scored a goal, but was unfortunately first whistled for offside. Only he wasn’t, not at all. A shame, because with the Scudetto race, these things do not need to be the talking points. But it was one of those mistakes that happen, certainly we’ve benefitted from other’s misfortunes this season, too. It was not an egregious error, but tell that to my heart, that jumped up in my throat, and is now bleeding from the result. Here is where I get ugly. In the 69th, Bonera earned a yellow card. For a stupid foul. He made another rash tackle that could have been a second yellow in the 72nd. So in the 82nd, when he made yet another rash tackle, the ref had no choice but to award him a second yellow and send him to the showers. Which means we were down to 10 men for the last 12 minutes, and we also won’t have him available for the next match (Please, Thiago Silva, come back as planned on Wednesday!) He did not have a great game, he had one, maybe two clearances of note, and played sloppy and slow the rest of the time. Was he left stranded when Bologna countered quickly? Yes. But I was not impressed with the rest of his game, and hope Allegri takes note that he’s back to the form of the old Bonera we all dreaded and cursed. Another poor performance by our also recent hero, Antonini. He was nowhere to be found on offense or defense, couldn’t give or receive a cross to save his life, and I think at least Allegri figured that one out in good time, as he was subbed off for Urby in the 69th. Urby was more aggressive on offense, I don’t even remember if he came back on defense, but at least by the time he came on, we needed to press full steam for the last 25 minutes, and he could do that. "Uh, you see... The cat ate my homework..."
In the 73rd Allegri used his third and final sub. Go ahead, read it again, you read it right. He brought in Aquilani for van Bommel, who could rightfully be blamed for the Bologna goal, and was struggling a bit emotionally if not physically after just returning finally from injury. Maybe not the best birthday for him. 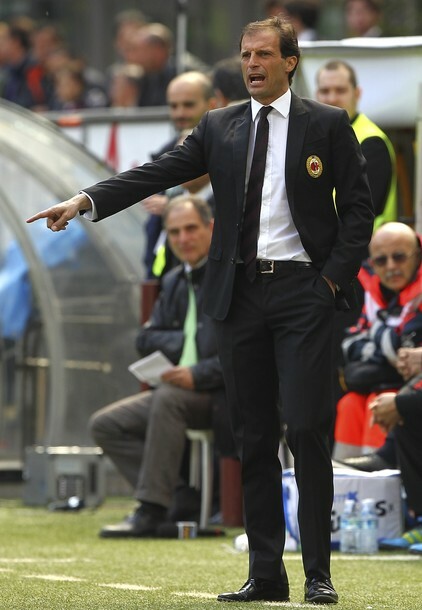 But the real story is that Allegri showed some balls in the substitutions. With so much on the line, not only did he sub in a timely manner, but he also subbed well. For that, he is my MotM. Too bad it still wasn’t enough, because I really could get used to this Allegri. Wow, Allegri, where did you find your balls? They look good on you. Muntari didn’t make a lot of contributions in the match, but he earned my “What the hell just happened here” award in the 84th for fouling/getting fouled by Taider, stepping on Taider while he was down, and somehow managing to get Taider awarded the yellow. For getting stepped on. That is magic. The Ibra and Cassano show provided more magic, testing Agliardi and the Bologna defense again and again. We had 21 shots with 6 on target, compared with 11 shots from Bologna, with only 5 on target. For example, there was the cross from Cassano in the 75th that Ibra tried to head in but was saved, and the overhead kick from Ibra that just went over the crossbar in the 87th. But after being fouled in the box, called offside, and otherwise stopped, Ibra pulled one out in the 90th. 1-1. Nocerino and Robinho would have misses in stoppage time, and Abbiati a nice save at the other end, but in the end. We took only 1 point, to temporarily tie with Juve until they meet Roma later tonight. After having sacrificed sleep to be awake for this match, I ask myself “What in the hell am I doing?” But I already know the answer. I am supporting my team, the team I dream of, the team whose colors are coursing through my veins. When they hurt, I hurt, and it’s not as if they didn’t leave it all out there on the pitch. Unfortunately, my heart was also out there, and I think it got stamped on by more than just Muntari. But it will keep beating and bleeding for Milan through these next 5 matches. We lost 2 very valuable points today, and have no one to blame but ourselves. Bologna got the best of us physically and mentally, and now we have to win every match to dream of keeping our Scudetto hopes alive. We may have been foiled again, but we are not out of the race completely. And even if we were, I’ll still be waking up early on Wednesday and again on Sunday. I love my boys, I love my team, I love these colors - win, lose or draw. Siena vs. Milan: Game On! Milan vs. Genoa: Game On! Sulley Muntari: Man or Monster? Are We Doing Something Wrong? Chievo vs. Milan: Game On! Milan vs. Fiorentina: Game On!